When getting, a classic lash set a 0.15 or 0.20 lash is applied to 1 natural lash. The Volume technique is a pristine method in which you are SAFELY applying anywhere from 2-6 super fine (0.05 to 0.10), lightweight extensions per natural lash. The lashes are applied in a fan shape to 1 natural lash. 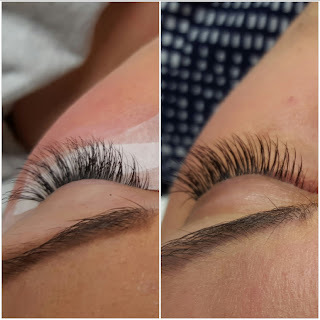 The Volume technique is a pristine method in which you are SAFELY applying anywhere from 2-6 super fine, lightweight extensions per natural lash. Many who have heard about the new volume technique have various questions like is it safe for the natural lashes? Is it too heavy? Will it damage the natural lashes? With the Volume technique, you can apply more lashes, using less weight. This allows you to create fuller more lush lashes. Especially for those who do not have many natural lashes. Volume lashing is indeed a technique. It is not a type of lash. You are using certain diameters for the volume technique. But it's all about how you apply them. With volume, you are still isolating perfectly one natural lash, but instead of applying one single classic lash, you apply a handmade “fan” or “bouquet” of thinner diameter lashes that are hand-crafted to customize the perfect weight for every single natural lash. As well as using less weight, and being able to customize the lengths, and how much weight goes on to each lash, this technique also allows you to use less glue. Sounds odd, right? More lashes, less glue? But with the technique, you are taught to wrap the adhesive around the natural lash. All the extensions support each other and using less adhesive means less allergies, less irritations. This service takes longer than classic lashing. You can go longer in between fills, the extensions are lighter on the natural lashes making long-term wear even more plausible. You will be happier because you have SOFT, full lashes that look and feel more natural. Volume lashes on the other hand, are lighter than classic lashes. 1 (3D, 0.05) Volume fan weighs less than 1 classic lash. Also, a lot less glue is used during the volume technique so you don't feel any weight on your eyes at all. You just see beautiful fluffy lashes. (Ah, please note, “volume does NOT mean caterpillar thick, I-can’t-blink look). Volume Eyelash Extensions look “Fluffier”.